The first time I saw picture of a darter was in my ichthyology class, second semester of my junior year. We’d just finished covering marine fishes of the eastern US and were starting on the freshwater fishes. I couldn’t believe my eyes. I never knew there were such beautiful fish right outside my door. The first time I saw a darter in the flesh, I was forever entranced. When most people think of North American fishes, largemouth bass (Micropterus salmoides) and channel catfish (Ictalurus punctatus) are the first things to come to mind. These large gamefish are the ones that are seen and talked about the most, so it is no wonder that is where most minds go first. But there is so much more in our waterways than just these well-known fish. Surprisingly a lot of these are pretty easy to keep in a tank. They don’t need heaters like tropical fishes and some can be kept in ponds year-round. In the US we have a lot of members of the cyprinid family—minnows—that are remarkably easy to care for. They are just like the barbs and rasbora of Asia. These minnows are subdivided into dace, shiners, and chubs. They are shoaling and prefer groups of six or more. North American minnows do best in 30+ gal (113 L) tanks and for the most part are just fine with other species of minnows. My favorites are mountain redbelly dace (Chrosomus oreas), saffron shiner (Notropis rubricroceus), and turquoise shiner (Cyprinella monacha), but these are just the ones I have in my backyard. 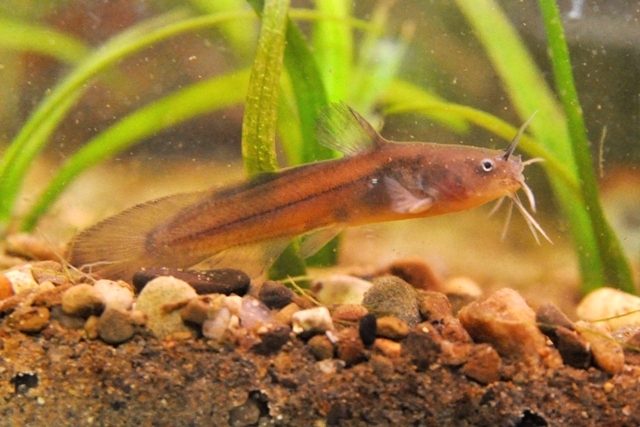 For those that like the cute appeal of the corydoras and other tropical catfishes, there are also cute catfish in the streams of North America: the madtoms (Noturus spp). They have the typical catfish look but stay small enough for a 30 + gal (113 L) tank. Some species are spotted or speckled with a bit of color, but their most entertaining qualities are their catfish antics and their adorable whiskered faces peeking out of rock caves. Darters (Etheostoma spp) and (Percina spp) are the gems of North America. Hands down I believe they are the most stunning fishes we have here. They have reds, blues, greens, and yellows to match some of the most beautiful tropical fishes. 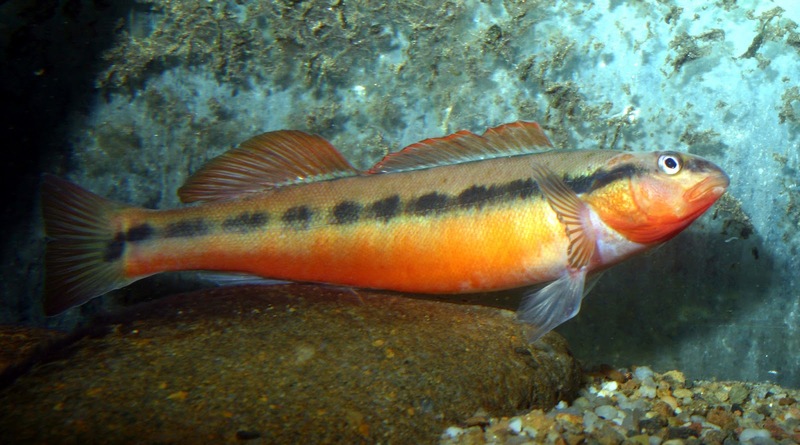 But they have a catch: darters come from cool, flowing water. You have to provide that if you keep them in an aquarium. This often includes powerheads or simply a river manifold. Darters are also territorial, so make sure to provide enough hiding spaces for them in a tank. In the wild, they can just swim down to the next riffle; they don’t have that luxury in a tank. 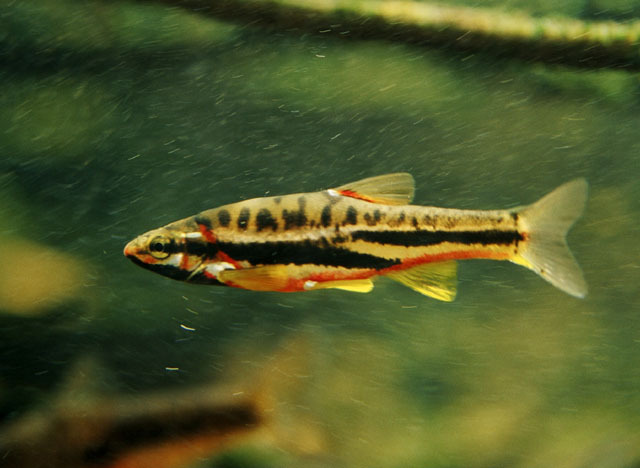 I have seen a few tutorials for how to set up a darter-specific tank like this one from the North American Native Fishes Association (NANFA). Or you could just use a setup typical of hillstream loaches detailed here at Loaches Online. When most people think sunfish, they think about bluegill (Lepomis macrochirus) or crappie (Pomoxis nigromaculatus). 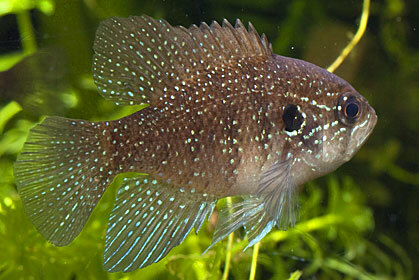 These large cichlid-like fish are only a few of the centracidae family found in the US. While not all of them are beautiful, there are a few worth pointing out. The pygmy sunfishes (Elassoma spp) are certainly some of the most stunning. They are the smallest fishes detailed today in this article; they can be kept in tanks as small as 10 gal (37 L). Pygmy sunfishes are also the most delicate and can prove difficult to feed. They are very shy and need a heavily planted tank with things like anarcharis, hornwort, and duckweed. 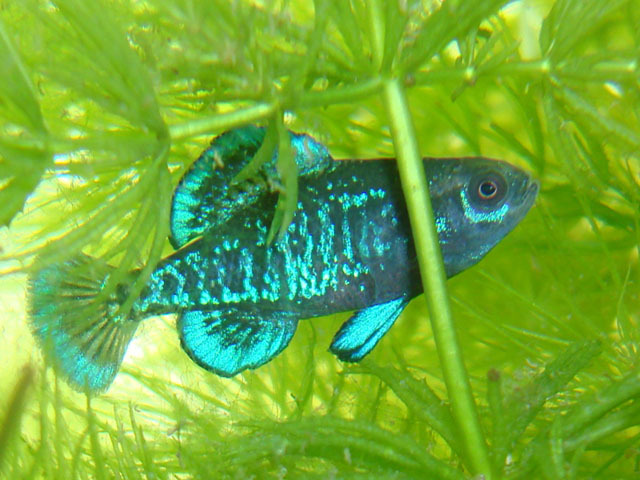 They were once described to me as “not for the fishkeeper who needs to see their fish every day.” Unlike with most of these fish, you probably won’t be able to find pygmy sunfish in your backyard. They are generally restricted to coastal areas of the eastern US. For those that like to see their fish a little more often, there are other more visible sunfish. The banded sunfish (Enneacanthus obesus) and bluespot sunfish (Enneacanthus gloriosus) are a good choice for a medium sized tank. With colors and temperament matching the South American cichlids, they make an excellent fish for a 30 gal (113 L) to 70 gal (265 L) native tank. Unlike the darters and minnows, they prefer the pools to the faster water. 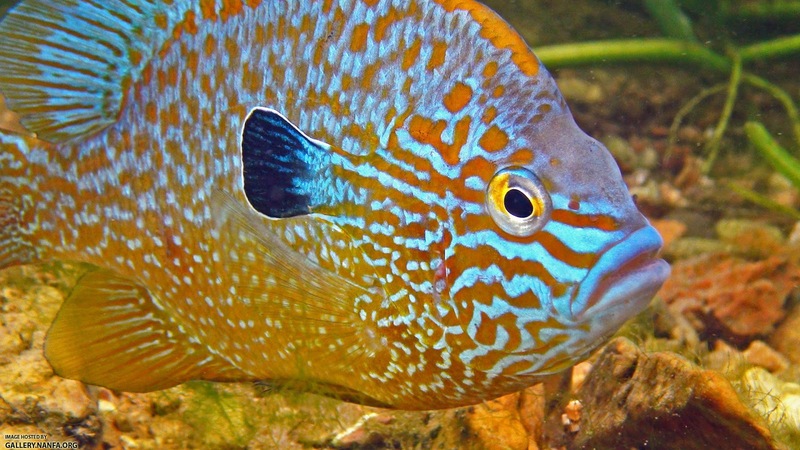 Those with a much larger tank might enjoy the some of the most brightly colored Lepomis spp species like the long-eared sunfish (Lepomis megalotis), redbreast sunfish (Lepomis auritus), and pumpkinseed (Lepomis gibbosus). These fishes will need a 100+ gal (378 L) tank as they get large and are territorial much like the larger South American cichlids. These fishes also make interesting alternatives to goldfish and koi in a pond. 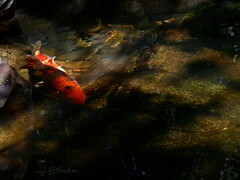 In clear water their beautiful colors can easily be seen, especially during spawning. The North American fish lineup also includes some livebearers and killifish. While these aren’t the most colorful, they are still interesting to keep in aquariums nonetheless. Some of the best looking are the flagfish (Jordanella floridae), northern studfish (Fundulus catenatus), and the sailfin molly (Poecilia latipinna). This isn't intended to be a comprehensive guide to North American natives. I just want to open your eyes with this article and let you know there are lots of choices out there. If you have a further interest in these fishes, I highly recommend joining the NANFA forum. I am aware there is a bias in the listings of fish here: they are almost all from the eastern US, but that is where I live. I am most familiar with the fish in my backyard. I encourage you to get familiar with the fish in your backyard no matter where you live. You never know what little beauties you may find! "BTDarters." Updated: 26 Jan 2013. Retrieved: 11 May 2013. "Compatibility and Feeding of North American Native Fishes in Aquaria." Jonah's Aquarium. Updated: 11 May 2008. Retrieved: 11 May 2013. "North American Native Fishes: Captive Care." Zimmerman's Fish. Updated: 15 April 2013. Retrieved: 11 May 2013. Sung, Stan. 2011. "Forest Gems: Fishes of the Streams of the Deep South." www.aquabotanic.com. Retrieved: 11 May 2013.
i'd really learned so much to this blog,id really admired to your work,i can apply some of this to my blog also.thank you.